Need ideas for elderly games that combine fun and function? Here’s a great place to start! As important as it is for people of all ages to keep learning and exercising their brains, it’s crucial for seniors who want to stay sharp, says Lynn Wilson, founder of The CareGiver Partnership, a national online retailer of incontinence products and other home health care supplies. 1. Learning new hobbies: An excellent way to exercise the mind, learning something can involve reading and research, the fun of buying supplies and practicing. In groups, teaching others a new skill encourages socialization and can be fulfilling for the senior in the know. Considerations include horticulture, crafts, cooking, learning to use social media and much more. 2. Math games: Remember the fun and challenge of practicing math skills using flashcards? Purchase flashcards at a learning shop, toy or book store, or online, or make a set yourself for an elderly loved one. This can easily be modified into a group activity — organized a math bee with prizes! 3: I Spy: A favorite game for all ages, all you need for I Spy is two or more players. One person selects an object, such as a table, and says, “I spy something that begins with the letter T,” or “I spy something brown.” Players take turns and the person who correctly guesses the most is the winner. 4. Puzzles: Everyone loves puzzles, and fortunately they’re available in all sizes, themes and difficulty levels. Shop for puzzles your senior loved one might enjoy or make your own. Simply print enlarged copies of favorite family photos and mount the paper on cardstock before cutting. Making your own puzzles offers the added bonus of recognizing familiar faces and reminiscing over past memories. 5. R.O.S. Therapy Systems: These are activity sets created to exercise the brain and stimulate memory skills and hand-eye coordination. 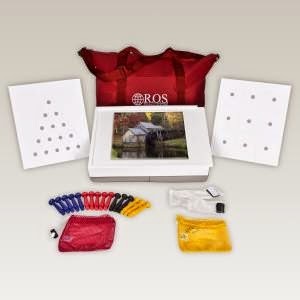 Designed for those with Parkinson’s, Alzheimer’s and developmental challenges, R.O.S. patented modular activity sets, such as the Legacy Bundle Package, allow caregivers to customize activities based on a senior’s preferences and abilities. R.O.S. Therapy Systems are ideal for use as an ice breaker or reminiscence tool and can be personalized to a loved one’s past occupation or hobby. Activities include puzzles, tic-tac-toe and much more. 6. Super-sized games: Making larger-than-life versions of favorite games can add novelty, promote mobility and also helps the visually impaired. Pick up some large poster board at any hobby shop and make tic-tac-toe or bingo cards with colorful plastic plates as chips. 7. Word games: An inexpensive, portable and effective way to exercise the brain, word games include large-print crossword puzzles, word find and Sudoku books. 8. Memory games: From playing card sets where participants try to match pictures, to creating your own memory flashcards in the style of trivia games, memory exercises are a great way to help keep a loved one’s mind alert. 9. Traditional games: Put a fun new twist on favorite traditions by shopping for jumbo playing cards, colorful dice and classic board games with new themes. 10: Electronic games: In addition to the wide variety of battery-powered, portable games found at department stores, there are an endless number of apps for all ages that can be played on tablets, smartphones, laptops and desktop computers. For more ideas and information on senior health and wellness, visit The CareGiver Partnership blog. Or call 1-800-985-1353 for personalized help from experienced caregivers.